In January of 2009, a fully loaded Airbus A320 took off from LaGuardia Airport, encountering a birdstrike two minutes into its flight, wrecking both engines, and then four minutes later ditching in the Hudson River with no casualties. It remains the most successful emergency water landing in aviation history, and is the subject of the much longer than six minute movie Sully. 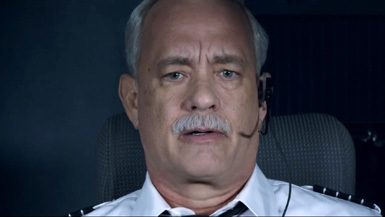 Tom Hanks plays the eponymous pilot, Capt. Chesley Sullenberger who became a national hero for a period of time after the accident, praised for his quick thinking and ability to get the plane down safely with no power to the engines. What this film proposes to show is the after-the-fact investigation of the incident which questioned whether Sullenberger took unnecessary risks in getting the plane down, and the personal turmoil the event took on him. It feels a bit... thin, even at just over an hour and a half long. Directed by Clint Eastwood, it's in line with his “heroic men's men, mistreated by the system” kick he's on lately, and trying to pretend Sullenberger was anything but deified from the start stretches credulity. It does have those incredible six minutes of action during the flight to lean on, however, and that's what this movie is really hanging its hat on. It's a bit like Flight, but for real, and without the alcoholism – and in this case, some character flaws probably would have improved things. If anything, Sullenberger is too noble of a character to make a movie about. Comparing with Flight, that film opened to just under $25 million, and that is close to right for Sully. It's notable that Hanks isn't a sure fire box office draw just on his own merits anymore, with this spring's A Hologram for the King never even making it into wide release. I'd look for about $23 million this weekend. A thriller targeting largely African-American markets, When the Bough Breaks seems to be something of an update on The Hand That Rocks the Cradle. Morris Chestnut and Regina Hall star as a successful couple who hire a surrogate (Jaz Sinclair) to carry their child. Naturally, things being what they are, jealousy develops and Sinclair decides that while she's there and pregnant (and crazy) she might as well just take over the wife role too. Violence and yelling ensues and the family order must be preserved. Lesson learned: never hire a hot surrogate.